Need to change money to get some bolivianos. Will not be able to cash on my visacard until Oruro. The banks does not change money. Just private change offices and the rates are according to this. In the end I decide to change most of what I've left in pesos. Around 300 d.kr. They are willing to in one office. I send e-mail and pictures. And now I'm sitting waiting for the archaeological-ethnical museum to open at 3 p.m. The train leaves at 11 p.m.(? ), you have to be there one hour in advance. My luggage I've left at my hostel. The train is as expected. Lots of local chileans or bolivians with colossal packages, bags, chairs, sacks with onions... anything. And there I step up with a bike! The train staff is not enthusiastic, but it gets onboard and me too. It now occupies one of the two toilets. There are quite a number of backpackers. Most are french, but we're a group who speaks english together: a dutchman, an englishman, a moldave and I. It's not wooden seats as I thought it would be, but when we boarder the train it's totally dark - that is the train! I think I still have all my luggage. But the heating is missing. There are heaters, but they don't work. It's an awful night, I avoid going into details. When the day begins you have to scrape the ice on the window pane in order to look through. We arrive at Ollagüe (chilean border town) around 8 a.m. During a couple of hours we've checked out of Chile, handed over the right paper, getting the right stamp. 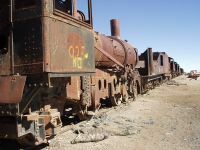 Then we go to the bolivian side and our chilean locomotive leaves. There are no passport or customs authorities but no locomotive neither. They'll arrive together probably, but when? Now it's 11.45 a.m. It's 1.00 p.m. customs and passport registration is long over, but just as it seemed we were stuck here, we were added to another train that arrived later. The customs officers are very efficient. Now they're checking some bolivians luggage for the third time. The rest of us, 'gringos' as we are called, they don't care for, but the bike! But when they learn that it belongs to a gringo they stop caring. It's 3.30 p.m. and a locomotive has arrived from the chilean side. One of the staff has uttered: 'Vamos', so maybe we'll be leaving soon? 3.55 p.m. the train leave. Quite encouraging and I enjoy the landscapes until darkness. But I'm not worth much, an unpleasant headache has begun. 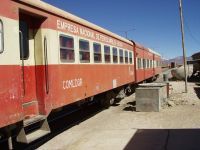 We hope to arrive at Uyuni at 7.45 p.m., then it will be across the street, past the plaza and in the middle of the next 'querda' is Hotel Avenida, which was recommended by the girl in 'Camino del Inka'. 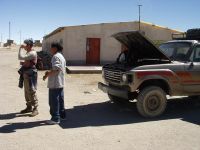 She inherited from Uyuni (or a village nearby to be exact). What have I done voluntarely. Why couldn't I have taken the bus as normal people? But the other gringos have been interesting. Now I see the lights ahead: my goal is near. The last 1½ day have been rough. I slept around one hour last night and 3½ this night. And I've had this painful headache. And what does that mean? Altitude sickness! My breath has been weird too. As if it runs the normal rythm, exept every second minut where the body finds out that something is missing, and suddenly has to take some deep breaths to compensate. Most uncomfortable. And even what's left of a cold and an aching throat beside. This night I really felt far out. But during the morning I'm feeling better. So well that I had to go ROLLING a bit on the bike. That's all you can do because of the roads. After some searching I found the road to Colchani and Ururo (and Salr de Uyuni). It looks bad but not terrible. Under the circumstances I've given up my tour in the Salar. It's between -10 and -15 degr. at night and that should do as for the equipment, but unfortunately not for my health. In stead I'd signed up for a tour in the Salar, all the places I wanted to go on bike. Then I can do some research, because I still want to do a minor trip on bike when I leave from here the day after tomorrow. How is Bolivia? With a weaker economy, that's obvious. 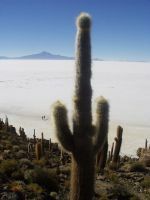 On the other hand Uyuni resembles San Pedro. Lots of tourists, lots of tour-agencys. The bolivians seem more private than the chileans. Less kindness towards gringos. But their money is allright. I buy something for 6 BOB. Give her a five'r and two. That's fine. No, I gave you 7! Really? 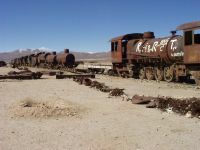 The only tourist attraction in Uyuni is 'El cementario del Trenes', the train cemetary, which is somewhere outside of town, according to Lonely Planet to the south west. I find my compas and roll along, it's probably the only time I'll use it. I ask some people anyway just to make sure and find it. The locomotives which are the most interesting is far away, of course. I think I'm all alone but all the time people show up among which some from the train, and we agree to meet at 'Cactus' and have llama steak, which should be available there. When I go to find the named Cactus I meet with 3 french cyclists, which have arrived from the north but with a bus, so I can have no details about the road. In the cactus we share a bottle of red wine and I get immidiately an aching stomach, but when I eat slow it disappears little by little and this llama steak is EXCELLENT. I didn't sleep last night, at least not what I call sleep, but rested I have I guess. I wonder if I ever get to function normally in these heights, which actually only is 3600 m. I have been up to 4400 m. But that was only for 8-9 hours and that doesn't have the same effect. I live in hostal 'Europa the Best', which is a misguiding name, because 'best' is not the proper word for the conviniences. 20 BOB - 25 d.kr. for a bed in a 4 bed dormitory. 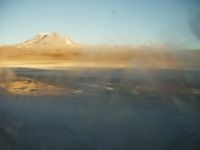 There is one more reason why I'm given up my cycliing in the Salar. A biking guy from Switzerland, who lives here too, and has been stranded for 14 days with something he'd come to believe is pneumonia, have tried it, and as he said most solemn: 'The salar almost killed me!' The wheather can't be trusted this year and there's rather deep water at many spots. I've been sitting in the sun now at 9 a.m. and written this. It has been nice, but now when a light breeze blows it gets too cold. It not above freezing yet I think. The tour is as expected. We've only done 500 m when it comes to a stop. They try to get the engine going again, succeed, but the engine doesn't have the right sound, and we're a skilled "team", this is not going to work and we don't want to strand for the night in the salar in -15 degr. We insist on having the car changed and they do it. But first we walk all the way to the train cemetary which, unfortunately for me, is part of the trip, and are picked up there, so we start out 1½ hours late. THe team consists of a norweigian couple, a german couple, a japanese and I. I have the pleasure the be able to speak german to the germans, danish to the norweigians and english to the japanese. It's a bit strange to speak to someone in my mother tongue! But for practical reasons we mostly speak english, that's our common language. 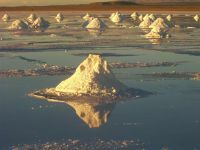 We make a stop to look at salt extraction, first what they do to the salt when it is "shipped in", and shortly after we're out in the infinite white plain, where the salt is shoveled in piles shaped as cones to dry out. To a dane this look like a icy lake - the size of Sealand, I have to mention. 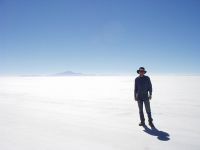 Bolivia reveals itself from its best side: Deep blue sky and where the white plain meets the sky, the horizon is broken by blue grey summits in a distant mist. To our right the vulcan Tunupa and surrounding mountains, you can't miss that. To the left a mountaineous country where the village Colcha K is situated somewhere down the bottom. And ahead 3 smaller summits, which, as we drive on the salt breed, and in the end two darker spots, of which the left is our goal: 'Isla de Pescados', reveals themselves. The fish island. On this the authors of Lonely Planet disagree, they stubbornly claim that the name is wrong. It should be 'Isla de los Pescadores', meaning fishermens island. The first one is situated somewhere else and should have it's name from it's shape, that should resemble a fish. But never mind, my goal is at hand. Our arrival is late because even this car isn't perfect. The temperature of the cooling water has raised too much, and we have to have a break. When we didn't see it before, it's, here on this enormous white plain, due to the shape of the Earth and it is not very high. The black shadow in front of us grows, the shape could actually resemble a fish from here, but maybe even more a crocodile, but they probably doesn't know such species here. When we arrive we've done 70 km on the salt plain. From a closer range the crocodile grow hairs, that's cactus's on top of the ridge, and in the end it looses it's black silhuette color and turn 3 dimensional. I wonder where we'll 'board'. I'm on top. A very faint humm from a small ant like car in the distance, is all which can be heard. Now it's totally quiet. Down the reception are hundreds of people but up here I'm all alone. On top the 'end of the world'? Anyway it's a very isolated spot. Now I hear a banging drum and distant flutes, it's some stupid bolivian orchestra from La Paz, that has arrived by bus. Do we have to listen to this noise? Not in Bolivia. It's like sitting in my garden in Åkirkeby and hear them play at the town square. It's nice there. Not here. After some nice sandwiches which were included, we go back. The problem has been located, but nothing can be done. It's the automatic fan that has stopped. We have to go easy on our way back. Once more I get a lot for my money according to travel time. Why am I always unlucky? Back in Uyuni after a nice day, where we end watching the sunset and where I'm glad I didn't use one or two days to go to this interesting but touristic spot I guess I'll go straight for La Paz. Next contact can't be before Oruro in 6 days. From there 4 days to La Paz, arrival 20.08.02?